Flipping the calendars to May and fresh mornings remind us that we are well and truly in autumn. Bircher muesli from the fridge gives way to warm breakfasts. And what better way to warm up than with freshly baked scones. 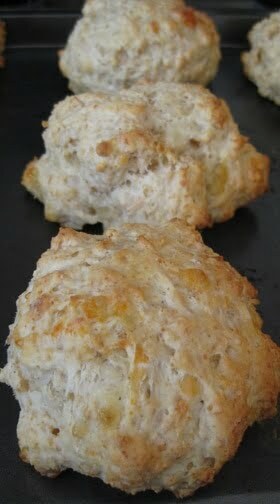 Scones fall in the quick breads category as they are made with self raising flour. This scone recipe in particular is simple and easy, you don’t have to reserve it for special weekend breakfasts. I make buttermilk scones on school mornings as well. If the picture of rubbing the butter into flour, cutting circles, sticky hands and kids running wild instead of getting ready for school comes up, relax. I can tell you I love baking but wouldn’t do anything complicated on a busy morning. I get up, turn the oven on, go to the bathroom, make the dough, bake, then wake up the kids to a lovely aroma – good trick if they aren’t keen to leave the warm beds :-). 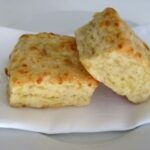 This buttermilk scones recipe is based on the original CWA (Country Women Association) show scones recipe published in the Epicure years ago. The cut out from The Age newspapers became yellow with time. I gave it my twist replacing milk with buttermilk. Buttermilk scones are fluffier, but still crunchy outside. Note: If you don’t have buttermilk, just use the same amount of milk. If you consume buttermilk regularly, click on the link to learn how to make your own endless supply of buttermilk so you never run out. Mix flour and salt in a bowl . Add cream and buttermilk and mix with a spoon or knife until the ingredients come together into crumbly dough. At this stage you can tip the dough onto a floured bench and knead it briefly or for a rustic look just scoop portions of dough using a spoon or hands onto a floured tray and bake. The second option is handy in particular if you are in the hurry or if the dough is too wet for kneading (see photo on the bottom of the page). Roll the dough or flatten with hands to 1.5 cm thickness or thicker if you prefer really tall scones. Make sure the dough isn’t sticking to the surface below. 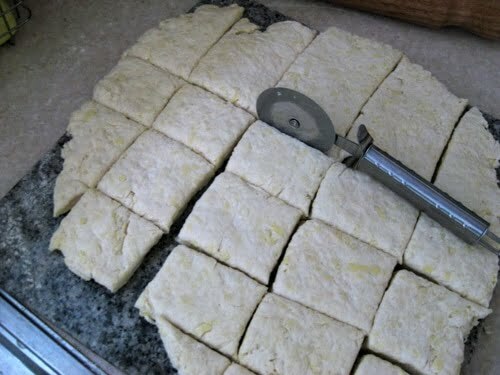 Cut the dough into squares using a pizza cutter or a sharp knife. 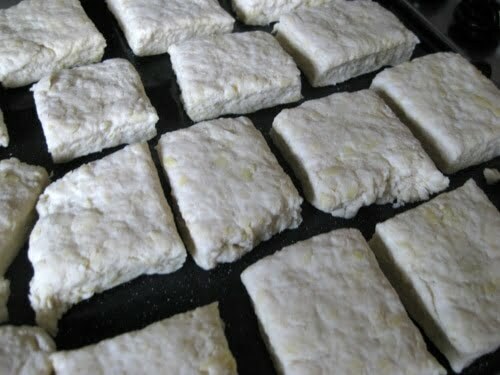 Square scones are faster to make as there aren’t any cut-offs and re-kneading to do. For a traditional look, use round cutters, press into the dough without twisting. Whatever the cutting tool, it should be sharp and leave clean edges without squashing them. Place the scones close together onto a floured tray. Alternatively heat up the tray with the oven and place the scones on the hot tray without flour. As you can see, to save time I didn’t bother cutting the outer edges. Bake on the top shelf for 10-15 minutes until golden. 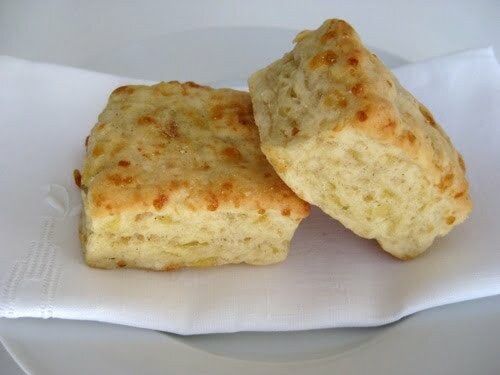 To make cheese scones as on the top and bottom photo on this page, add a cup of grated cheese. Or create your unique scone variety.